As the sun slowly rises in the early mornings of Japan, Kenji a young and bright high school student eagerly heads off to school. In his high-collared black uniform and with his backback strapped around his shoulders, he blends in easily among the crowd of other high school students walking to school or riding the trains. Teamwork and Collaborative Learning in Japan: Here’s a snapshot of children at a Japanese elementary school during their gym class. Source: Jim from Switzerland. Like many other boys his age, Kenji enjoys good food, music, and sports. Surfing, playing the guitar, and mogul skiing are currently at the top of his list. Before class starts, he gathers with his friends, chattering about the weekend or their sports hobbies. Asked about who his role-model athlete is, the young Japanese student cheerfully grins, “pro-surfer Kelly Slater,” an American professional surfer crowned World Surf League Champion 11 times. But besides sports and surfing and the daily musings of high school, what makes Kenji stand out the most is his love for physics and lifelong learning. Humble and intelligent, the young teen enjoys applying his knowledge from what he learned in class to create interactive physics simulations. Also known by his username nakahiro, he uses MIT Scratch programming to build various simulation models. From simple harmonic oscillations to fluid buoyancy, Kenji has created over 75 original physics simulations so far! Wow! One of Kenji’s many physics simulations! This one is on simple harmonic oscillations. “Physics is my favorite subject. The programming and simulations are both easy to use [and] easy to understand…I would like to tell [others] that we can simulate many phenomena using mathematics and programming,” the teen shares excitedly. What is the physics behind our glass lens? For a brief catch-up on our physics basics, lens can include our glasses or even those on our cameras. Two common types are concave and convex lens. Concave and convex lens are shaped differently, and depending on where an object is placed in front of the lens, different images (varying sizes, upside down, etc) can be projected. 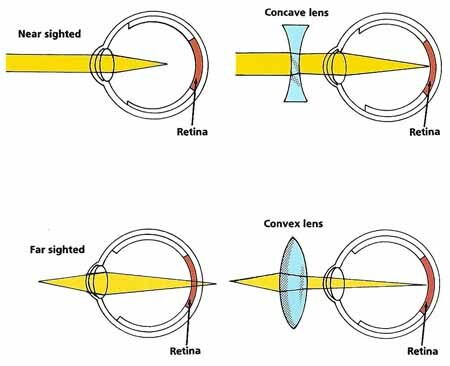 Concave lens are thinner in the middle, and when light rays hit it, the rays diverge. Concave lens, also known as diverging lens, are often used to correct nearsightedness. Convex lens, on the hand, are thicker in the middle, and when light rays hit it, the rays converge. These lens are also known as converging lens and are used to correct farsightedness. Kenji’s boundless curiosity and eagerness to improve demonstrate to us that age is only a number. “I am a lifelong learner. People around the world (including me) can learn a lot by making projects,” he says. As renowned Stanford Professor Carol Dweck would say, Kenji embraces the growth mindset. According to Professor Dweck, there are two types of mindsets: fixed and growth. Fixed mindset means that a person believes that intelligence is a fixed trait – we are born with a set amount of intelligence. Success is solely on ‘talent.’ Yet, the growth mindset embraces the idea that we can get smarter and stronger by effort. There is no predetermined set of intelligence. This healthier growth mindset powerfully shapes our understanding of learning, and that by effort and motivation, we can attain higher achievement. Many thanks to Kenji for sharing his visionary and educational project with us! For more of his physics projects, check out his MIT Scratch programming profile. If you enjoyed this post and interactive simulation on lens, feel free to comment below, give us a like, share, or subscribe. Thank you again for visiting Moosmosis! Please Like our Facebook page to support us! Created by students, for students and lifelong learners! Love your blog! Great job everytime! Thank you, Deepali! We appreciate it. Thanks to y’all so much for making this awesome blog!! Thanks so much, Grahm! We look forward to sharing more on our e-learning platform, and thank you for your enthusiastic contributions as well! Thanks July! We love Scratch programming too! We also really enjoy your coding site – keep up the fantastic work!! Any of you coding for web? Yes! Some of our members are coding educational games actually! 😀 Thanks again July! You are most welcome guys 😁 Using Scratch? was it detected as spam?